Information > Frequently Asked Questions > How does the reclamation or treatment process work for recycling water? How does the reclamation or treatment process work for recycling water? Water can be recycled from treated sewage water using different degrees of treatment to produce a defined quality of water which will be fit for the intended purpose (See How do we manage any risk associated with using recycled water?). Australia’s water industry is one of the world leaders in water recycling. They use some of the most developed and robust treatment technology and have a strong commitment to water recycling. The Australian Guidelines for Water Recycling refer to any recycled water as being fit-for-purpose, rather than classes of water. However, State and Territories still refer to recycled water using a Class System. Class A is usually the best quality recycled water as it must meet stringent microbiological health standards before it is fit for the purpose of irrigating all crops, even fresh vegetables (Class A+ is used in Queensland and refers to the same very high quality recycled water described as Class A in other states). It is generally produced using tertiary and/or advanced treatment processes (See figure below) and includes a disinfection process. There are also lower classes of recycled water (B, C and D), which for health reasons have restrictions placed on them. For example, restrictions include: crops that can be grown (fresh versus produced peel or processed); the extent of direct human contact with the water; and the method of irrigation (spray versus subsurface drip). The treatment processes are carefully controlled and monitored using food safety systems (e.g. Hazard Analysis and Critical Control Points – HACCP), ensuring consistent water quality and compliance with State, Territory and Commonwealth (Australian) Guidelines. Recycled water must also be fit for the intended purpose from an environmental perspective. 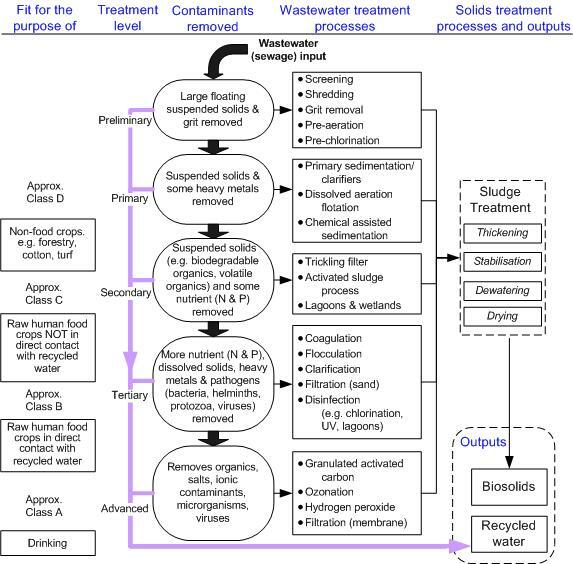 Treatment processes focus primarily on pathogen reduction (human health) in recycled water (See figure below). However, part of the recycled water treatment process can also substantially reduce nutrient and other contaminant levels, making it safer in aquatic systems (e.g. environmental flows). Advanced treatments can also remove salts resulting in more environmentally sustainable irrigation systems. However, the more water is treated, the greater the cost. A balance between economic and environmental sustainability and safety is often sought by government and industry.